GoKart, a the new mobile app ordering solution for time-poor food and drink businesses looking for quicker, easier and more convenient ways to order from their suppliers, claims it’s set to be the food business’s best friend. The app will allow food and grocery retailers, caterers, restaurateurs, hotels owners and publicans to order from their favourite suppliers anytime or anywhere, right from their tablet or smartphone. An end-to-end capture system, GoKart, keeps business suppliers to hand at all times. Food and drink based businesses can replenish low stock in an instant by scanning their usual stock’s barcodes, which adds items easily to their baskets for future ordering. The app can also be used to also swipe through catalogues to discover exciting new food and drink items. GoKart is also a fantastic way for food and drink businesses to acquire new suppliers and stockists, the company claims. By simply scanning an item that’s of interest, GoKart will find the stockist and send them a request to approve them as a new trade buyer. With a useful invoicing system too suppliers can quickly invoice the business for stock ordered. The app features Great Taste Award winners, fine food suppliers and British food suppliers and gives food and drink businesses money back through a cross supplier loyalty system. Each time a food and drink business orders from a supplier, a business earns a discount which can be saved for future reference or used against their next order against any supplier. 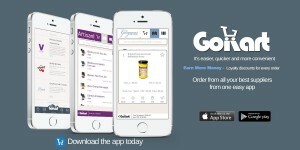 GoKart’s founder and CEO, Anx Patel, said: “Having worked in retail and later wholesale business for the last 17 years, it became apparent for the desperate need for a quick and easy 24 hour ordering system for the food and drink industries instead of the current inconvenient and slow website ordering. “The phenomenal adoption of tablets and smartphones has allowed us to create a unique ordering system. True 2014 convenience is now mobile, anywhere, anytime and on any device. “The drive for easier, quicker and more convenient ordering is a passion for us. GoKart is an end-to-end order capture system with no set up costs. With Gokart wholesalers and suppliers receive a branded free ordering app that features an online order capture system, available products, and a handy invoicing system.